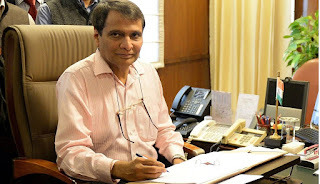 Our Correspondent ● Kolkata: Union minister for railways, Suresh Prabhu, has said that the government will invest around $140 billion over the next five years to fuel the growth of Indian Railways. The focus will be strongly on infrastructure development, which should comprise 11–12% of GDP, he said on the sidelines of an event in the city today. “The most important benchmarks are quality of service, passenger safety, a shift to clean energy, and increased accountability,” he said on his vision for Indian Railways by 2030. The railways have set up a new directorate to enhance revenue from non-tariff sources and to shift away from the usual system of one-third revenue from passengers and two-third from freight setup. “Public-private partnership models and plans for joint ventures and foreign collaboration with at least 13 countries have been taken up to make the railways really viable,” Prabhu said. Hemant Kumar, member, mechanical, Railway Board, said: “There is a huge requirement of about 60,000 coaches and 2,40,000 wagons every year.” Referring to the high speed corridor, he spoke about redesigning the coaches to ensure speed. AK Mittal, member, engineering, Railway Board, pointed out that the expenditure on new lines has been doubled this fiscal. He said that the planned outlay has increased from ₹34,400 crore in 2015–16 to ₹49,950 crore in 2016–17, out of which around ₹4,000 crore has been allotted to projects in West Bengal.